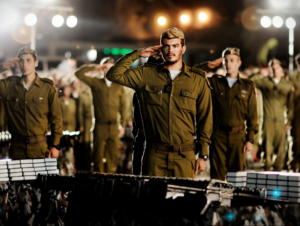 Authors Leah Katzenel Ever Wonder What a Day in the IDF Is Like? Have you ever wondered what 24 hours – an around-the-clock full day would be like in the IDF? Well, now you don’t have to worry. This is SO cool. You can see, from early in the morning, through the day…what a few soldiers are doing, thanks to the IDF. Sit back. Get some popcorn. And watch one of the most advanced armies in the world show you just a bit of what our sons and daughters to each day. It’s about dedication. More, it’s about determination. It can’t be easy to get up every day knowing that the day is not yours. You have promised this day to the land in which you live. They will tell you when to wake up and what to eat. From them, you will receive your clothes and your food. Also, they will decide how long you have to take a shower, sit down and rest, even drink a bottle of water. But, above the dedication and above the determination is one thing. One very simple thing. Above all, it’s about love. Love of their family and their friends and their country. They know they stand directly between the enemy and their homes. That simple. Really. They are not fighting some war in a far off land. The rocket they miss, the bullet they can’t stop – can crash into their homes. Without any doubt, they carry with them the knowledge that it is THEIR home being defended – if not in this conflict, than in the next. If not today, than tomorrow. What has changed over the years, to some small extent, is the weapons they bring against us. They’ve tried tanks and planes. Bombs in our malls and buses. And they tried axes and knives and guns. Let’s not forget stoning attacks and ramming attacks. Now, their weapon of choice is again fire. Arson attacks are not new, but the fires and explosives being delivered by condom balloons and kites is. Through it all, day after day, our soldiers stand against our enemies. Here’s a great video of 24 hours in the army of Israel.